For the money, the Dimension E521 certainly delivers. Dell has recently cast aside its tradition of using Intel processors and built a series of PCs sporting the chips of rival manufacturer AMD. 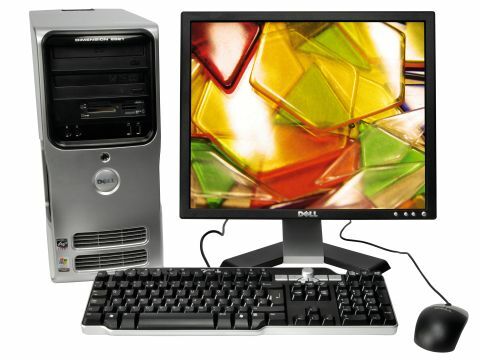 This machine is one of the first AMD based systems to adopt the BTX form factor. When you encounter an interesting system like this, the first thing you'll want to do is have a look at what's going on inside. This system is housed within a great case: pull the big clip on top to pop the side off with ease, and it doesn't put up a fight about going back on, either. The only thing missing is handles for easy lifting - something that the silver and white Apple-look styling might lead you to expect. The Dimension E521 is intended for use as a media centre PC and the interior design lends itself well to keeping the noise down. The BTX arrangement places the CPU right at the front of the case next to the air vents, which is the most efficient position in terms of cooling. Both the processor and graphics card have passive heat sinks, so the only peep you'll hear is the hard driving whirring away. There are two optical drives: one DVD-ROM and one DVD-RW. This is a slightly strange state of affairs, but there's no harm done, particularly since they both have neat SATA cables. There are two 512MB sticks of memory, leaving a further two slots free for extra DIMMs. For graphics we have the middle-of-the-road 256MB ATI Radeon X1300 Pro, which is fine for media play back and more than adequate for games. This card gives you VGA, DVI and S-Video connectors. The dual-core Athlon has plenty of horsepower; it's capable of juggling the affairs of even the most demanding multitasker. There's also a 13-in-1 media card reader beneath the optical drives for transferring your photos and videos conveniently. The E521 is suited for use as a media centre and general-purpose PC. It comes with Windows XP Media Center Edition and a remote control, but unfortunately no TV tuner card. There are three free PCI slots to install one if you want. There are two 250GB SATA hard discs, but these are arranged as a RAID 1 mirrored pair for back-up purposes, so you only have 250GB of storage capacity. The second drive holds an exact copy of the first, so you've always got an up-to-date backup. The 19-inch bundled monitor has a slim bezel and the stand clips straight onto the back with no fuss whatsoever. There's no DVI connector, only VGA. This screen won't wow you - it's a standard, unexceptional affair, but at this price point there's nothing wrong with that. The keyboard comes with a wrist rest and has media controls with a pleasingly chunky knob for the volume. There's no recovery disc with this system. Instead, you hit a key combination on start up to launch a recovery utility that's stored in a hidden partition on the hard drive. At least there's no risk of losing your recovery disc at a vital moment. It's a shame it lacks a TV tuner, but other than that this is a well-designed PC with generous specifications that will handle practically anything you throw at it with aplomb.